"Blessed are the meek: for they shall possess the land." (Matt. 5:4). O Jesus, Thy spirit is the spirit of meekness and complete devotion to God. "Learn of me, because I am meek, and humble of heart." (Matt. 11.29). "My meat is to do the will of Hun that sent me, that I may perfect His work." (John 4:34). 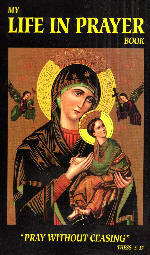 This is abo the spirit of Thy Mother, for she was a living image of Thee; she was the humble handmaid of the Lord. "Behold the handmaid of the Lord; be it done to me according to thy word." (Luke 1:38). Holy Communion makes me both Christlike and Marylike. Only when I become like Thee and Mary - completely dependent on God's holy will and His love - only then shall I possess the land of eternal bliss beyond the grave. O Jesus in the Sacrament of the Altar, Thou art the one Source of my holiness; therefore, my aim should be to reach Thee. I am holy only insofar as I become like Thee and belong to Thee through perfect love. Of myself I am poor and helpless. For this reason Thou hast given me, in thy last moments on the Cross, Thine own dear Mother so that she might be my very own. "Woman, behold thy son.~.Behold thy mother." (John 19:26-27). No one ever belonged to Thee so completely as did Thy Mother. Thou didst spend the greater part of Thy life on earth in her company, but Thou didst live in her by Thy love and by Thy grace more intimately than Thou dost in all the Angels and Saints. I wish to imitate Thine example; I wish to belong entirely to Thy dear Mother, for this is Thy wilL I give everything I have to Mary, in order that I may, in as nearly perfect a manner as possible, give all to Thee for Thy greater glory through the hands of Thine own Mother. Thou hast willed to make Thy Mother a perfect image of Thyself. She is the masterpiece of God's creation. She is so much like Thee that Thou dost want me to love her and, by loving and honoring her, to become more like her-Marylike. Only then shall I be trufy Christlike. O Jesus, I wish to imitate Thy dear Mother, especially in her devotion to Thee in the Blessed Sacrament of the Altar. It was the summary of her last years on earth. How fervently did she unite herself with Thee as St John daily offered the Holy Sacrifice of the Mass in his own home. She saw the Sacrifice of Calvary repeated before her very eyes, though now in an unbloody manner. With what ardent love did she daily receive Thee into her heart in Holy Communion! It was the same Body she had conceived of the Holy Spirit at the Annunciation, the infant Body she had carried in her arms at Bethlehem, the bleeding Body she had seen hanging in torments upon the Cross on Calvary, the Glorified Body which had ascended into Heaven. What emotion she must have felt as she knelt in Thy Eucharistic presence and recalled all those happy and sorrowful events of her life with Thee! Her faith and love pierced the thin veil which separated her from Thee. Help me to love and imitate her as Our Lady of the Blessed Sacrament because she gave Thee to me. From her, the most pure Virgin, Thou didst assume flesh and blood so that Thou mightest redeem me and become the Food of my soul in Holy Communion. O Jesus, at Holy Communion I become Thy sanctuary, but what a poor dwelling I offer Thee, the King of Heaven and earth! Mayest Thou ever find Mary, Thy Mother in my heart when I receive Thee! She will entertain Thee within me and offer her Immaculate Heart to be Thy dwelling place, because Thou dost find Thy delight wherever she is. Do not behold my poor soul, but rather look upon the virtues and merits of Thy dear Mother, to whom I belong. O Jesus, I realize that I cannot be a true child of Mary, nor can I be like Mary, unless I have a very tender devotion to Thee in the Sacrament of the Altar. The Holy Eucharist must be my treasure, as it was hers. I can do nothing that would please Thee or her more than to be Marylike in my devotion to the Holy Eucharist Mary is the shortest and surest and easiest way to Thy Eucharistic Heart. May frequent Holy Communion make me Marylike, in order that I may become more Christlike! Are you meekly subject to God's holy law and wholly dependent on His love as Mary was? Do you realize that it was Our Lord's dying wish that you should belong entirely to His Mother, imitate her example and thus become more like Him? Do you attend Mass, receive Communion and make visitsto the Blessed Sacrament frequently, in order to become Marylike in your devotion to the Holy Eucharist? Do you often prepare yourself for Holy Communion and make your thanksgiving in union with Mary, so that she may make up for whatever is taking in your devotion and love? Aspiration for the day: O Sacred Heart of Jesus, I give myself to Thee through Mary.